The amplifier (or amp for short) is the unit that boosts the electronic signal of your bass guitar and sends it to the speaker, which takes the signal and converts it into sound. The speaker is just as important as the amp. In fact, if you don’t have a speaker attached to the amp, nobody will be able to hear you. Guitarists can start out with a little 15-watt practice amp, but bassists don’t have this option, because low notes require a lot more power than high notes. So you need to practice a little fiscal irresponsibility when purchasing your amp: You need to spring for a larger, more expensive one. A combo or separate amp and speaker? With a separate amp and speaker: The amp and speaker come as two separate units and are connected via a speaker cable. The advantage of buying separate units is that you can get an amplifier from a company known for making good-quality amps and a speaker from one that specializes in speakers. Additionally, the separate amp and speaker are more powerful. Start with a combo amp that has between 50 and 100 watts of power (it’ll run you anywhere from $200 to $1,000). That’s enough for practicing at home, rehearsing in the garage (get the car out first), and playing at the local pub. If you start playing at bigger venues — parties and weddings, for example — go for a performance amp and speaker with at least 300 watts. Yes, they’re pricey (from $400 to $2,500 and beyond), but they’re well worth it. You want to feel the rumble, don’t you? Solid state amplification refers to technology that uses transistors and/or microchips for amplification. Tube amplification refers to technology that uses vacuum tubes for amplification (like the red, glowing tubes in the back of old radios). Selecting between solid state and tube amplification is a personal choice, although some people swear by one or the other. Try several different amps (using your bass) at a music store to see which sound you prefer; you’ll notice a subtle difference between the two. Bear in mind that solid state amps usually weigh less (often much less) than tube amps. Amplifiers have a variety of speaker sizes, whether separate or part of a combo amp. Bass speakers that are 10 or 15 inches in diameter are best. Some speaker cabinets have a combination of different speakers as well. 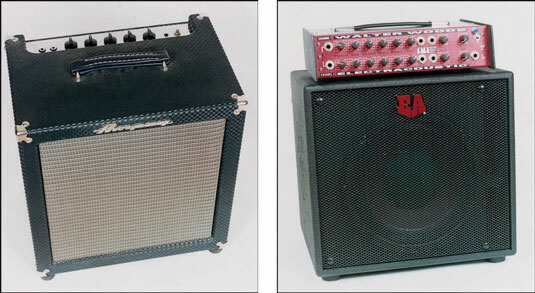 For example, the cabinet may have a 15-inch and a 10-inch speaker in the same enclosure. The larger the speaker, the more boom you hear in the sound; the smaller the speaker, the clearer the tone (but with less of the bass sound). Try different ones with your bass to find out which you prefer. You may want to start out with a 15-inch speaker and eventually graduate to a cabinet that has four 10-inch speakers. Just remember that you’re the one who has to move all this equipment; you probably won’t be able to count on your singer for help. Fortunately, speakers have been getting lighter with the advent of neodymium designs, so moving your speaker cabinet doesn’t have to be like moving a fridge anymore — well, for a price. Volume: This knob raises or lowers the volume of your bass. Bass: This knob raises or lowers the low tones (frequencies). If you don’t have enough bass, the tone sounds tinny and weak; if you have too much, the tone sounds boomy and undefined. Mid: This knob adjusts the midrange tone. If you don’t have enough midrange, the tone sounds undefined; however, too much midrange and the tone honks (not a pleasant sound). Sometimes amps have one knob for high mid and another for low mid. Treble: This knob adjusts the high tone. If you don’t have enough high, the tone sounds dull; if you have too much high, it sounds piercing. Experiment with different settings, and keep in mind that you have to readjust your settings to compensate for the unique acoustical qualities of the room in which you’re playing. Be sure to listen carefully to your sound during the sound check. When experimenting with the sound of your amp for the first time, start out with all the knobs flat (no added bass, treble, or mids); then adjust the tone on your bass guitar until you have it roughly where you like the sound. 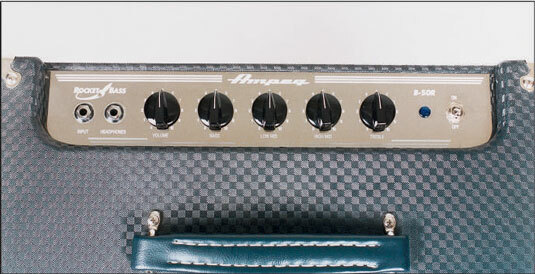 After that, tweak the knobs on the amp, one by one, to enhance the sound.